The NIC-9712PT PCI Express Dual RJ45 TOE server adapters are network interface cards that contain multiple / single independent Gigabit Ethernet port/s. The Silicom PCI Express TOE server adapters provide a fully integrated up to Layer 5 solution along with a complete Gigabit Ethernet port/s. 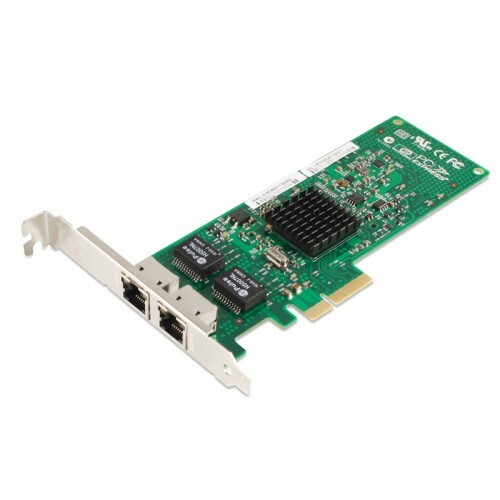 The NIC-9712PT Gigabit Ethernet PCI Express TOE server adapter is a high performance server network application. The NIC-9712PT Dual RJ45 Gigabit Ethernet PCI Express TOE server adapters are based on Broadcom TOE controller features an industry first support for single chip TOE Gigabit Ethernet NIC with TCP / IP offload Engine, RDMA NIC (RNIC)-, iSCSI 1.0- /iSER HBA. The NIC-9712PT Dual RJ45 TOE server adapters include dedicated hardware and processors to process the frame that traverse it functionality. On the transmit path, the TOE controller Copied the data directly from the highest hierarchy of buffers available, execute the TCP/IP, adds lower level headers. On the receive, path, the TOE controller process frame up to the highest layer supported present in the frame, removes lower level headers, posts the data directly to application buffers. The transmit and the receive TOE functionality relieves the host CPI from the from these time consuming operations. The NIC-9712PT Dual RJ45 Gigabit Ethernet PCI Express TOE server adapters enables fault-tolerant via teaming. Traffic from the failed port is routed through up to seven other members of the team. The NIC-9712PT Dual RJ45 Gigabit Ethernet PCI Express TOE server adapters are the ideal solution for implementing multiple network segments, mission-critical high-powered networking applications and environments within high performance servers.